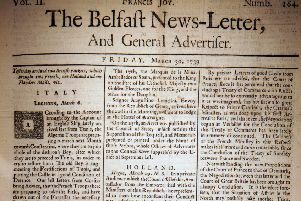 A faded newspaper clipping from 1947 arrived in Roamer’s mailbox this week, copied from “a web site about old Belfast”, the sender explained. The clipping (too faded to reprint) was an old black and white photograph of actress Angela Lansbury with her mother. Though only a teenager at the time, Angela is instantly recognisable as Jessica Fletcher from Murder, She Wrote, the longest-running detective drama series in TV history. Accompanying the old photo was a short introduction to Lansbury’s mother “from the Ormeau Road and known locally as Chattie McIldowie. Her parents were William and Brigid McIldowie. Chattie started her career as an actress in Belfast and moved to London where she changed her name to Moyna MacGill”. Her daughter – Dame Angela Brigid Lansbury DBE – has had a spectacular TV, film, theatre and singing career and she’s often quoted as attributing her singing-voice (Mame and Gypsy) to her maternal grandfather, who was keenly involved in Belfast’s busy choral music scene. Early in July 1924 the News Letter carried a headline – ‘Moyna Macgill’s New Film Certain to Attract Huge Audiences’. The article was about her film called Miriam Rozella, a silent, British-made drama-movie starring Moyna and released in March – a year and a half before daughter Angela was born on October 16, 1925 in London. 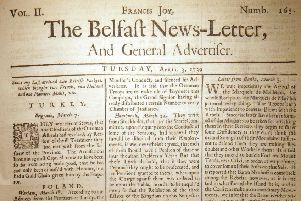 Miriam Rozella was screened “before a large audience” the News Letter reported, “in the Imperial Picture House, Belfast”. The whole world knows Dame Angela Lansbury and the many parts she’s played in Gypsy, Sweeney Todd, The King and I, Bedknobs and Broomsticks and most famously, Jessica Fletcher in Murder, She Wrote. But her Belfast-born mother’s life on stage and screen, including several co-starring billings with daughter Angela, is a similarly intriguing story, much less told. She was born Charlotte Lillian McIldowie in Belfast on Decenber 10, 1895 and, probably influenced by her father William’s involvement in music and theatre, moved to London where she was on stage by the end of the First World War. Some sources say that she was spotted in the London Underground by director and producer George Pearson, who offered her a walk-on part in one of his films. In 1919 she married Reginald Denham, an English writer, actor, theatre and film director and producer. She made several notable early stage appearances between 1920 and 1922 including an adaptation of George Meredith’s drama ‘Rhoda Fleming’ at the Ambassadors Theatre and ‘Angelo: The Romance of a Great Composer’ in Drury Lane. Moyna’s debut in movies came in 1920 as Violet Grimshaw in Garryowen, a silent film about horse-racing directed by George Pearson where an impoverished Irish gentleman tries to rescue his family from ruin by running his horse Garryowen at The Derby. She appeared in several other London shows prior to her last silent movie before soundtracks were added – ‘Miriam Rozelle’ in 1924, reviewed by the News Letter as “a picture that is certain to attract big crowds”. She had two West End appearances in 1927, one with John Gielgud at the Strand Theatre and another in the long running ‘Interference’ at St James’ Theatre. Her marriage to Reginald Denham ended in 1924 (with one daughter, Isolde) and soon afterwards she married Edgar Lansbury, the son of Labour party leader George Lansbury. The marriage lasted until Lansbury’s death in 1934 and produced three children; the eldest was Angela. In 1942, together with all four children, Moyna moved to America, to a part in a touring company’s series of Noel Coward short plays. A minor role in RKO’s Second World War drama ‘Forever and a Day’ in 1943 restarted her screen career after a gap of almost two decades and she appeared in nine movies in two years, working for some of Hollywood’s major studios. Mother and daughter worked again in ‘The Picture of Dorian Gray’ in 1945, where Angela won a Best Supporting Oscar, and in ‘Kind Lady’ in 1951. Moyna made other TV, big-screen and stage appearances in The Twilight Zone, Dr Kildare, The Unsinkable Molly Brown and My Fair Lady.